Today we have another guest post written by one of our Archivists, Richard Wilson. The Children’s Society was founded in 1881 and has a long history of innovating and adapting to improve the lives of children and young people. Just as the organisation has changed, so too has our branding. Here we’ll take a look at how The Children’s Society has presented itself over the last 130 years. We started our work by establishing a single residential care home in Dulwich, South London for children living on the streets. 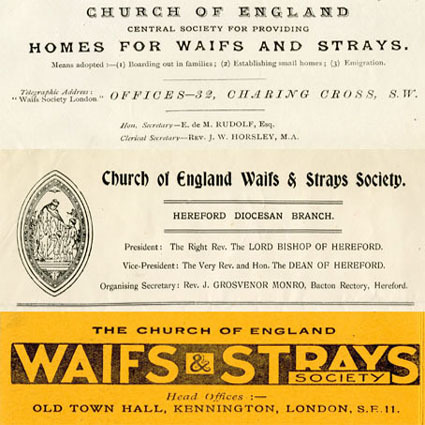 The organisation was initially known as the Church of England Central Home for Waifs and Strays, but this soon changed to the Church of England Central Society for Providing Homes for Waifs and Strays as additional homes opened (the word ‘Central’ was changed to ‘Incorporated’ in 1893). Despite this rather long title, we were commonly known as the Waifs and Strays Society or often just the ‘Waifs and Strays’. The composite below shows branding from 1888, 1903 and the 1930s. 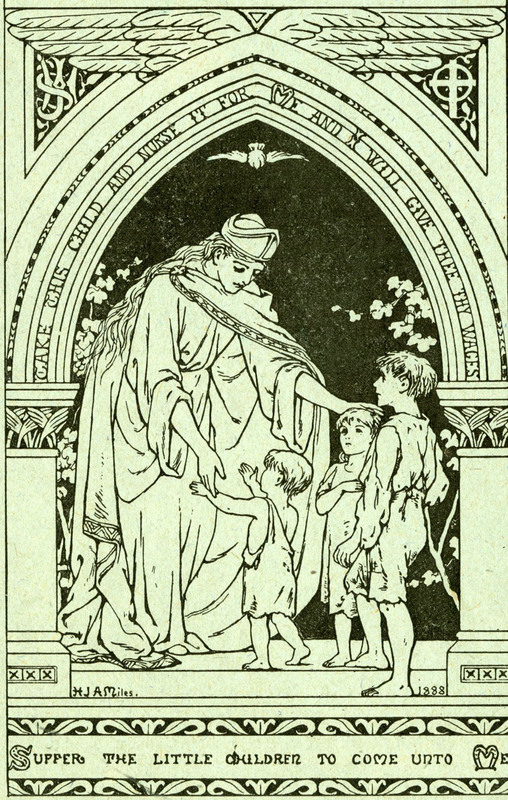 The middle part of the composite is taken from a letterhead and includes a lozenge shaped drawing on the left-hand side depicting Jesus with three young children. 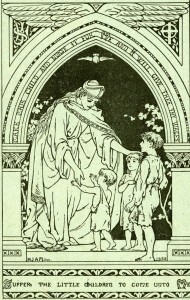 The drawing was frequently used by the Waifs and Strays Society in the early twentieth century and reflects the organisation’s Christian ethos. A complete form of the picture served as the cover image for our supporter magazine, Our Waifs and Strays, and is reproduced below. You will note that the drawing includes biblical quotes about the care of children, which are taken from Exodus 2:9 and Luke 18:16-17. In 1946 the Waifs and Strays Society changed its name to the Church of England Children’s Society. 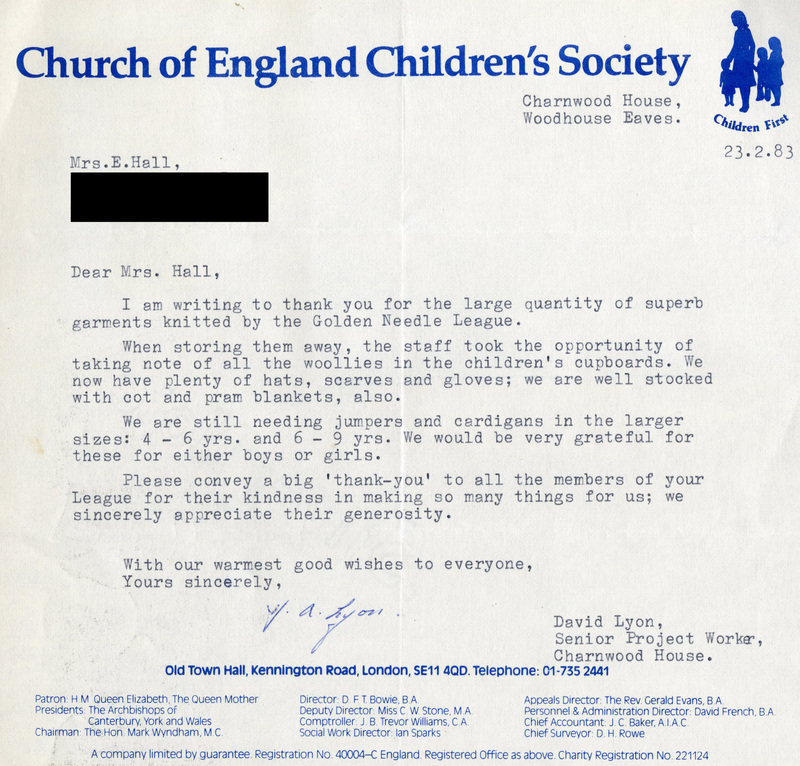 This is still our official name today, although we started to use our abbreviated title, The Children’s Society, for most purposes in the 1980s. 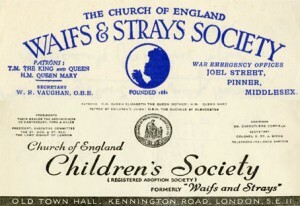 The name ‘Waifs and Strays Society’ enjoyed widespread recognition and fondness amongst many supporters. It had, however, become archaic by the 1940s and no longer represented the variety of children and young people with whom we worked. There were also concerns that the name could stigmatise those in our care. 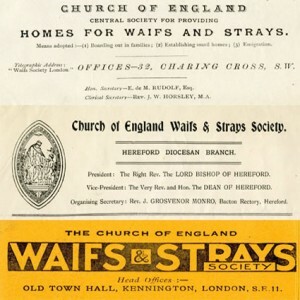 The composite below comprises letterheads from shortly before and after the name change. 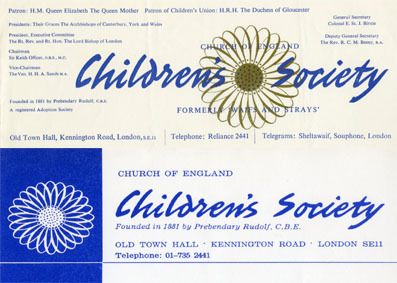 The Children’s Society used a sunflower as its logo between the mid-1950s and the early 1970s. The flower had already been used as a logo in connection with street collections and ‘Sunflower Days’ since before World War II and, in 1956, the Sunflower Guild was established for supporters who kept one of our collection boxes at home for regular giving. The composite below shows two letterheads bearing the sunflower logo. The top design was replaced with the lower one in around 1963. In the late 1960s we considered changing the name of the organisation, developing a new corporate slogan, or both. Suggested names included ‘Care’, ‘Child Savers’ and ‘Aid Britain’s Children’ (ABC). Whilst we decided not to change our name, we did use ‘Aid Britain’s Children’ as a slogan for a couple of years (top left image in the composite below). We adopted a new logo in the early 1970s showing an adult holding hands with three young children (lower image in the composite). A similar logo was used in connection with our Centenary celebrations in 1981 together with the slogan ‘Children First’ (top right image in the composite). Shortly after our Centenary celebrations we adopted new, simpler branding without a logo (top image in the composite below). This remained in use until 1988 when a colourful new logo was introduced depicting three children with the strapline ‘Making Lives Worth Living’ (middle images in the composite). The new logo was part of a wider rebrand which sought to focus on the positive difference that the organisation made to the lives of children and young people rather than the negative circumstances that caused them to seek our support. A further rebrand took place in 1998, when our previous logo depicting a person reaching for the stars was adopted. The original version of the logo had 13 stars (bottom left image in the composite), which could be interpreted as a representation of Jesus (the larger gold star) and the 12 Apostles, underlining our connection with the Church of England. The 13 stars also had historical symbolism, depicting 13 penny stamps – the first donation that our founder Edward Rudolf received over 130 years ago. Bottom right in the composite is the last version of the ‘reaching for the stars’ logo, which was introduced in 2010 and used until 2014 when our current branding was launched. Happy New Year! We start 2015 off with a guest post written by one of our Archivists, Richard Wilson. Around the time of The Children’s Society’s Golden Jubilee in 1931 we founded a needlework club for supporters willing to make at least one garment a year for the children in our residential care homes. 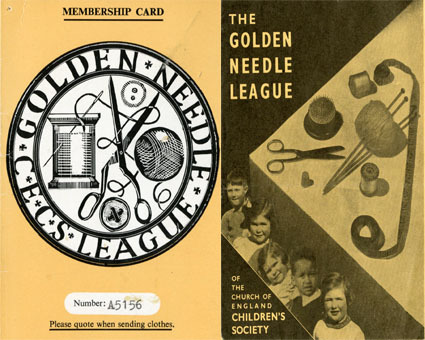 The club was called the Golden Needle League (GNL) and local branches around the country were formed for volunteers to meet together on a regular basis to sew and knit children’s clothing. Once finished the clothing was donated to a specific local home or sent to our head office in London for distribution according to need. The idea behind the GNL was to reduce our ‘formidable’ annual clothing bill and source high-quality, individual clothing for the children in our care. The GNL was a great success and by 1943 had over 8,000 members. 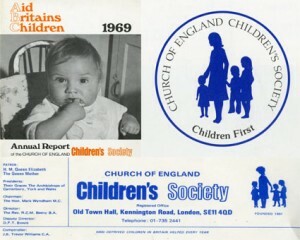 It continued to operate until 1971 when it changed its name to the Children’s Gift Scheme. The GNL was not a completely new initiative for The Children’s Society. A similar club, the Silver Thimble League, had been operating in the Liverpool area since 1897, and our supporters’ magazine had already been urging readers to make and donate clothing for several years when the GNL was founded. In 1968 a branch of the GNL was established in the village of Toton near Nottingham by Mrs Eileen Hall. As well as making clothes for children at several of our residential care homes in Central England and a family centre in Nottingham, the branch organised garden parties and other fundraising events for The Children’s Society. 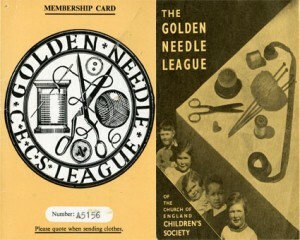 Every member of the GNL was issued with a membership card containing a golden needle (not made out of real gold! ), and the front of Mrs Hall’s card is reproduced below (left) next to an earlier promotional leaflet from the 1940s. 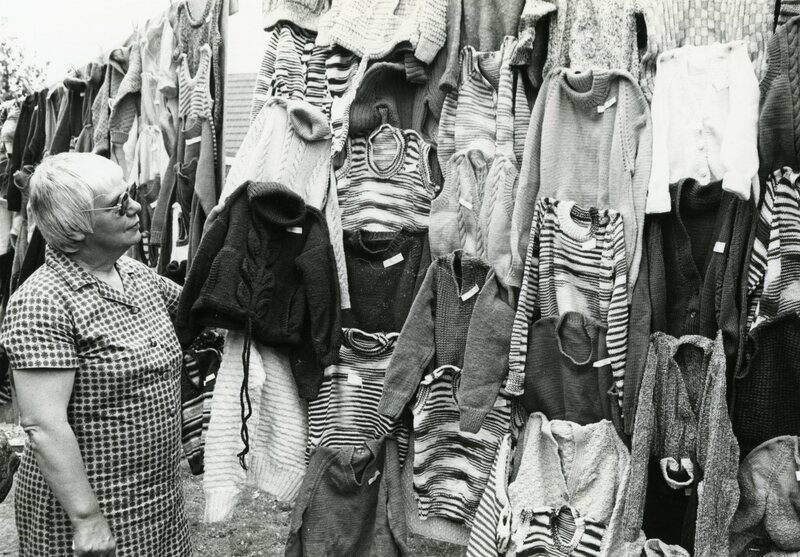 Underneath these items is a picture of Mrs Hall at a fundraising event in 1979 with several knitted garments made by the Toton Golden Needle League. 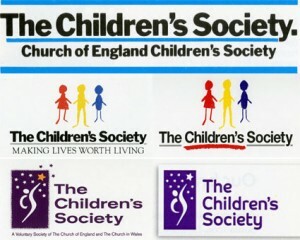 The Toton branch of the GNL continued to operate until 1993 (several years after the League had been discontinued at a national level) when it changed its name to the Toton Support Group for The Children’s Society. Mrs Hall ran the group until 2013 when she retired after an incredible 45 years of service. During this time she kept a meticulous account of the group’s activities in a series of 39 scrapbooks, which contain a wide range of material, including letters, photographs, publicity material, personal accounts of events and visits and financial records. 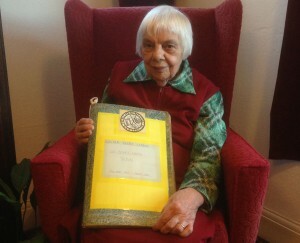 Mrs Hall is pictured below holding the first scrapbook, which she started in 1968. Mrs Hall has kindly donated her scrapbooks to our archive where they will be retained alongside our administrative and childcare records to help document an important part of The Children’s Society’s history – the work of our local volunteers and supporters. If, like Mrs Hall, you hold the records of a local Golden Needle League, fundraising or supporters’ group and would like to donate them to our archive we would be delighted to hear from you. You can reach the archive sending an email to Hidden-Lives-Revealed@childrenssociety.org.uk.